There’s little question that the Oral-B Genius Pro 8000 is among the most feature-rich offerings in the electric toothbrush marketplace. And most Oral-B Genius Pro 8000 reviews will confirm that this is an excellent ‘value for money’ product that ensures dental health and oral hygiene. If you’re in a hurry, be sure to check out these 3 major decision-making factors before you rush out to order the Oral-B Genius Pro 8000 electric toothbrush. 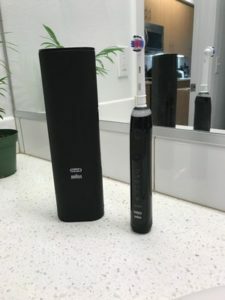 And if you’d like to learn all about it first, go ahead and read the rest of this detailed Oral-B Genius Pro 8000 Electric Toothbrush review. 1. Are there any glaring problems with this model? No. In fact, the Oral-B Genius Pro 8000 is a fantastic and efficient product. The only model from Oral-B that’s possibly better is the Genius 9000. If you had to pick something to call a drawback with the Genius Pro 8000, it would be the price which is higher than you might like. It isn’t the perfect electric toothbrush – but comes pretty close. For good, healthy teeth and gums, improved oral hygiene and a comfortable cleaning experience, the Oral-B Genius Pro 8000 can’t be beat. 2. Are other alternatives just as good? The typical buyer who is looking at the Oral-B Genius Pro 8000 is one looking for a feature-loaded and high-value electric toothbrush. Price often isn’t the primary consideration; value is. So when it comes to which electric toothbrush models are best with a range of cleaning modes and other bells and whistles, the Oral-B Genius Pro 8000 scores really high. Another great choice would be the Oral-B Pro 9000, which if anything, is even better than the Genius Pro 8000. But if you’re looking for a good all-round electric brush and don’t care as much for the smartphone app and other advanced features, then the Oral-B Genius Pro 8000 will save you a few dollars. To get a better idea of the factors to consider before choosing an electric toothbrush, be sure to browse through our Best Electric Toothbrush Buyer’s Guide here. 3. 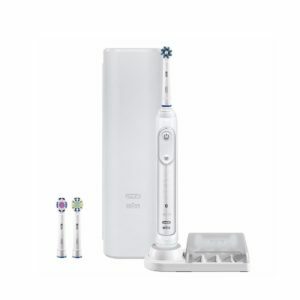 Where to buy the Oral-B Genius Pro 8000 electric toothbrush? Online e-commerce portals like Amazon are often the best places to buy because you’ll frequently find discount coupons and special deals going on which can help you save money. It’s also convenient and delivery is free. Another option is to look on eBay for one. If you’re only comfortable purchasing offline, you’ll find this model in most retailers like Walmart, Target and Boots. Two years after it launched a blockbuster success with Oral-B Pro 6000 , the bestselling model got some more improvements and tweaks to morph into the Oral-B Genius Pro 8000. For some users, the added features may seem redundant, even useless. 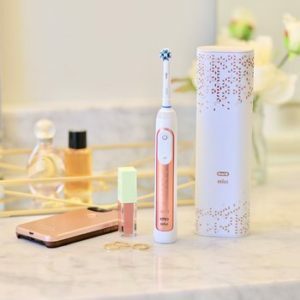 But the changing consumer mindset and entry into the market of younger audiences whose tastes and preferences differ slightly has led to these extras in an already popular brand and model of electric toothbrush. For instance, while some think the Bluetooth connectivity with a smartphone app isn’t adding value, there’s a generation who loves the idea of actively tracking teeth cleaning and records it to an app almost as second nature! The option to select from any of 5 distinct cleaning modes – Daily Clean, Gum Care, Sensitive, Whiten & Pro Clean – ensures that no matter what your unique teeth cleaning needs, there will be one to meet them. This becomes especially advantageous if more than one person shares the same brush handle, as it can cater to their unique specifications. Most users will require only the regular Daily Clean mode for brushing and plaque removal. However, having additional modes to cater to those with sensitive teeth and gums, braces, prior dental work and other special needs is a welcome addition. It is possible to cause damage to your teeth and gums by pressing too hard with an electric toothbrush. To prevent accidental injury, the Oral-B Genius Pro 8000 has an inbuilt pressure sensor. The sensor informs you whenever you’re pressing too hard while brushing. It lights up an LED in red color, so that you can stop applying pressure immediately. This is particularly helpful to first-time users of an electric toothbrush who may not realize that it doesn’t require pressure but mere application of the brush head to skim the tooth surface. While the device doesn’t have as good battery life as Philips Sonicare models, the Oral-B Genius Pro 8000 does last for 12 to 14 days after a single full charge. It’s an interesting tweak to ‘personalize‘ your Oral-B Genius Pro 8000 electric toothbrush . A 360 degree ring lights up in a different color of your choice, letting you create an experience that’s uniquely yours. It lights up every 30 seconds – and turns red whenever you apply too much pressure. The box contains everything you need to get started, including a charging station and travel case. The latter helps protect your toothbrush against damage during travel, and keeps it from getting activated unintentionally while inside a suitcase or bag. An interesting modern technological innovation is Oral B’s position detection feature. This analyzes the way you clean your teeth based on the position of your brush during the activity, and offers you feedback so that you won’t miss out on any portion. It makes sure you get the greatest benefit from cleaning and enjoy great dental health and oral hygiene. Most feedback on Oral-B Genius Pro 8000 review sites harp on this point – that the device is far more expensive than other models like the Oral B Pro 1000 electric toothbrush. For the range of features available, it is indeed fairly priced. The important question, then, becomes whether you are likely to use and benefit from them. If yes, then go for it. While the app and position detection technology are fascinating, the process of putting it to good use isn’t intuitive or easy. Setting it up and learning how to use it can be difficult. And for a 2 minute brushing experience, some feel it’s too much effort. With 5 cleaning modes, a pressure sensor, a choice of brush heads and a good travel case, the Oral-B Genius Pro 8000 has all ingredients of a well designed and packaged electric toothbrush. It’s true that many other Oral B models have the same (or similar) features. But there are some aspects that are unique to the Oral-B Genius Pro 8000 and set it apart from the rest. For one, the Genius line of electric toothbrushes from Oral B have bluetooth connectivity. Once you pair your device with an Android or iOS smartphone, the technological features can be activated and enjoyed. The companion mobile app lets you enable ‘Position Detection‘, a technological innovation that lets you track the position while you brush via the phone’s front-facing camera. The data is processed and displayed instantly on the smartphone screen, showing you any areas you have missed cleaning. You can thus avoid any overlooked areas, giving better cleaning results. In a sense, the app and its technology serve as personal monitors that watch over you while you clean your teeth. Imagine how effective you’d be if a dentist or oral hygienist were looking over your shoulder and offering advice. That’s exactly how this is supposed to work. 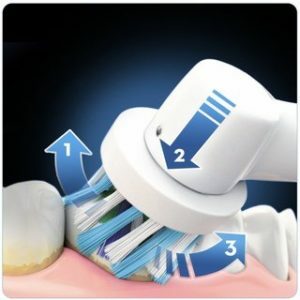 It ensures that you’ll brush for the desired amount of time, spending adequate time on each quadrant, and use the right technique – all through the feedback provided by real-time observing of your brushing method. And the benefits aren’t all theoretical. The company has shown through studies that more than three-quarters of all users don’t brush their teeth for long enough, and even fewer spend equal time on all zones. Especially ignored are the back teeth (molars) because it’s harder to reach them while cleaning. Not surprisingly, these are the teeth often prone to cavities and requiring filling or extraction later. The Position Tracking technology was devised in response to this need. It helps coach patients to clean their teeth thoroughly and for long enough to remove plaque and avoid cavities. With a visual display that’s easy to understand, users are more likely to develop better brushing technique and enjoy improved dental hygiene. Along with the benefits of this technology comes one of the biggest drawbacks of the Oral-B Genius Pro 8000 – a learning curve to set this up and get it running. But for the value it is likely to deliver, this should be a small price to pay. A smartphone holder that plugs on to a bathroom mirror or wall using a suction cup is included in the package. The arms are adjustable to accommodate smartphones of different sizes. After fixing the holder to the mirror, your phone’s front-facing camera can be directed at your face to track motion while you brush. The pressure sensor in an Oral-B Genius Pro 8000 electric toothbrush serves the same function as in all other models – and helps avoid damage to teeth and gums due to the application of excessive force while brushing. With any electric toothbrush, cleaning efficiency does not depend upon pressing forcefully. It happens just by the brush head skimming over the tooth surface. So pressing down too hard can damage both your teeth as well as the brush head, which wears out faster. With a pressure sensor, you’ll receive visible notification whenever there is extra force on the brush head by way of an LED in the SmartRing glowing red. Simultaneously, the motor slows down, stops pulsating and changes in tone, so that you’ll know there’s a problem. Another innovation of the Oral-B Genius Pro 8000 is its round brush head. This makes the brush head small and compact, allowing access into remote nooks and crannies inside your mouth such as behind the last molar teeth. Bigger brush heads with smaller handles often find it hard to reach inside these areas. An interesting element when you actually use the Pro 8000 to clean your teeth is how deep inside the mouth you’ll be able to reach, as compared with other models and brands. Some users are also thrilled by the ability to ‘personalize’ their electric toothbrush through the SmartRing which can be made to glow with a different color of your choice. There are 12 options to choose from. So much for design. Let’s discuss ease of use and how this brush is better than others in its class. There have been many aesthetic improvements made to the Oral-B Genius Pro 8000 over the earlier Smart series of brushes. It’s slimmer, for one, and this makes the brush easier to handle and move. The body is uniformly cylindrical and houses a larger battery that lasts around 2 weeks. Size and weight aren’t usually primary considerations when you buy a toothbrush, yet these are what influence your day to day usage the most. If a brush is too heavy or difficult to use, you’ll tend to shorten your brushing sessions or adopt incorrect technique. For children, however, the Oral B kids electric toothbrush is better suited because it’s designed specifically for younger users. The Oral-B Genius Pro 8000 is 24 cm long when the brush head is attached, and has a girth of 2.6 cm, weighing 140 grams. The body is a sturdy plastic and comes only in white color. The handle is water resistant and water won’t seep through if it spills on the surface. In fact, the brush is so completely sealed that you could even use it in the shower or rinse it under a tap. Leaving it immersed under water could cause problems, though. In appearance, the Oral-B Genius Pro 8000 won’t win any beauty contests. It is a dull uniform grey/white with buttons and icons that light up to indicate specific functions, even if you can choose from 4 handle colors – orchid purple, rose gold, black and white. One tells you the brushing mode in use. Another measures battery life. A third is the pressure sensor. The power button is located in the upper third along with the cleaning mode selector button, both within a rectangle panel that’s a break from the uniformity of a plastic body. Icons are sited below this to inform a user about the current mode in use. A design flaw seems to be that there isn’t an indicator for the most common Daily Clean mode. Perhaps the manufacturer assumed that this would be a default setting, and only any change from this universal norm needed to be notified to a user. Operating and using the Oral-B Genius Pro 8000 is child’s play. Pressing the power button turns on the motor. Press and hold the button for 2 seconds and it turns off. Only firm pressure will turn it on, so the chance of accidentally powering on the electric toothbrush is low. Switching from one cleaning mode to another involves pressing the mode selector button repeatedly. It’s the one with a downward facing arrow on the button. The indicator LED lights up to say which mode is currently active. A battery level indicator LED near the bottom of the handle glows white and shows through 3 bars the amount of charge it still retains. When you’re down to the last bar, it’s time for a recharge. A contoured rubber grip gives the handle a secure feel in your hand while brushing. You no longer feel fearful when the brush is wet and slippery that it’ll fall out of your hand. The indented dots help produce enough friction to allow bold and rapid movements without hesitation or unease. The handle’s bottom is smooth, with a small recess to fit in a projecting bit on the charging station. This design element also keeps the brush from rolling off a flat counter top. The Smart Ring LED is near the top, at the neck of the handle. Depending on your selection, it will glow with different colors… except for the pressor sensor which is always red. The brush and all accessories come in matching colors, so there’s no clash of contrast at all. Everything – the charger, smartphone holder, brush body and brush head – are available in white, black, orchid purple or rose gold. There are several options for cleaning modes in the Oral-B Genius Pro 8000. All of them are found also in other Oral B models. But the Pro-Clean is a newer innovation that’s introduced only with the Oral-B Genius Pro 8000. It replaces the Deep Clean mode and is designed to produce a thorough cleansing through vigorous brushing action. In fact, while running in this mode, your brush head will pulsate at an extra 3,000 times a minute. Usually cleaning modes are preset to run for 2 minutes, which is the typical recommended brushing duration by dentists. The inbuilt timer is configured for two kinds of modes – standard or professional. With ‘Professional‘ mode, the quad-pacer function is activated. At the end of 30 seconds, the brush will stutter for a few seconds to let you know it’s time to move to another quadrant, before starting up again. At the end of two minutes, a longer stuttering break indicates the end of a session. You can switch off the electric toothbrush briefly for a few seconds without interfering with this timing sequence. However if the brush is turned off for more than 30 seconds, the timer resets and a new cycle will begin from scratch. You can choose between the two available timer profiles. For this, you should press and hold the MODE button for 2 seconds, and toggle between timers by pressing on the power button. To confirm your choice, press once more on the MODE button. The LEDs light up to indicate your chosen mode and profile which are now active. How Does The Oral-B Genius Pro 8000 Work? Cleaning efficiency of an electric toothbrush is a function of the brush head, motor power and technology used. With the Oral-B Genius Pro 8000 , the brush heads deliver oscillating-rotating motion along with pulsations at a high frequency to clean your teeth and gums. Oral B technology is proprietary and patented. Its brush heads are engineered to be able to clean each tooth, one by one, and to reach every corner of your mouth for a more effective cleanse. The heads have a dynamic 3D motion that lets the bristles adapt to the teeth as you move the brush along. This enables plaque breakdown and removal of any food debris impacted in the crevices between teeth. Depending upon your unique needs, you may prefer one of the three kinds of brush heads included in the package. All Oral B brush heads are interchangeable and you can use them with any handle . Ideally, the right head should be combined with an appropriate brushing mode for the best results. Oral B Cross Action brush heads have bristles set at angles to each other for a better cleaning effect. When the brush passes over teeth, the angled bristles more easily reach into crevices between adjacent teeth as well as along the gum line, dislodging food debris and preventing plaque build up. Sensitive brush heads have softer bristles which are not angled but straight. This produces a gentler cleaning effect without abrasions or injury to the gums and surface of teeth. The 3D White brush head is tougher and has a cup right in the middle to polish tooth enamel and give it a bright gleam. It is similar to the cleaning effect you enjoy after visiting a dentist. Like other models, the brush heads of Oral-B Genius Pro 8000 electric toothbrushes also need replacing once every 3 months – if not sooner. The nice feature of this top-line toothbrush is how many ways you’ll be reminded of this. The companion smartphone app keeps track of your usage and tells you after the requisite number of minutes of usage that its time to replace the brush head. The indicator bristles on most brush heads will also remind you by changing color from blue to white. And a visual inspection of the bristles themselves will reveal when they are damaged or distorted. To avoid forgetting, you can even pre-schedule delivery of replacement brush heads on an automated calendar from an online retailer like Amazon. A charging station is inside the Oral-B Genius Pro 8000 package and it also doubles as a storage space for extra brush heads that fit inside a compartment protected by a molded plastic shell. You can store spare brush heads safely without worrying about damage or dirt. This is especially helpful if there are many people sharing the same brush handle. An LED display on the handle indicates when it is time for a recharge. As soon as the translucent battery icon flashes red, or when only the last bar is lighted up, you should charge the battery. Connecting it to the charger makes the battery icon glow a steady green, indicating that the battery is charging. It usually takes 20 to 22 hours for a full recharge. When your toothbrush is almost fully out of power, it will require at least a 30 minute charge before you can use it for a single cleaning session. To be on the safer side, you might consider leaving the brush on charge whenever it is not in use. That way you won’t run out of power suddenly. The latest version of the Oral-B app that runs on a smartphone supports the Genius Pro 8000 and other models in this range. The key component of this technology is the position detection function that helps ensure better cleaning of your teeth. The app is cross-platform compatible, running well on both Android and iOS phones and devices. However if you use a Windows phone or other alternative platform, the app may not work with it. 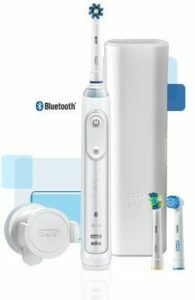 The app relies upon bluetooth connectivity to pair your Oral-B Genius Pro 8000 electric toothbrush with your smartphone for tracking and recording data. The app itself can be downloaded for free from the iTunes or Google Play Store services. The application is versatile and robust, loaded with many features to enhance your value from using the toothbrush. At the same time, it requires some learning and practice to understand and take advantage of all its functionality. You will be able to integrate the app with your calendar so that you can browse your day’s engagements and schedule while cleaning your teeth, or catch up with news and updates. This can be distracting at times, though, and interfere with adequate brushing. If you don’t like this, it’s easy to turn off these notifications. You have already learned about the Position Detection technology that uses the smartphone’s front-facing camera to track brushing activity and guide you to areas that are overlooked or unattended. The visual display is intuitive and easy for anyone to follow. To motivate yourself to achieve clean and healthy teeth, you can take one of many ‘challenges‘ that score you on how well and regularly you brush. This can help develop a good habit and better brushing technique. The social proof of displaying badges of accomplishment can motivate some users to enjoy better oral hygiene and dental health. The app also lets you set personalized goals and gives you tips or advice on better tooth care. It even recommends products and services that will enhance your oral hygiene. For example, if you desire whiter teeth, you can get tailored recommendations for how to change your routine to get this result, including the right cleaning mode, brush head or toothpaste to use. Your Oral-B Genius Pro 8000 app also offers a Professional Guidance component that connects you to a dental pro and empowers collaboration towards your dental health. Your dentist can even prescribe extra brushing time or tweak your cleaning schedule and mode through the app itself. All the data generated through using your Oral-B Genius Pro 8000 electric toothbrush is stored and backed up online. You can even share it with other related services for extra value. The logs can be incredibly illuminating and motivational as you review your progress over weeks, months and even years. And it will be amazing to see how your habits develop and sustain over time. The app works well and records information without any glitches. The brush itself can backup data from the last 20 cleaning sessions. On the whole, the only drawback is that you must fire up the app each time you want to store or view data on it. But considering the value you’ll get from it, this is a small price to pay. Only a few competing brands offer top of the shelf models like the Oral-B Genius Pro 8000 electric toothbrush , so the range of comparable products is small. Oral-B and Philips are the only major players in this space. Before considering whether or not the Oral-B Genius Pro 8000 is your best choice, you must decide what you really want an electric toothbrush to do. If all you need is a device to clean your teeth and keep your mouth healthy, this may have too many features for your taste. 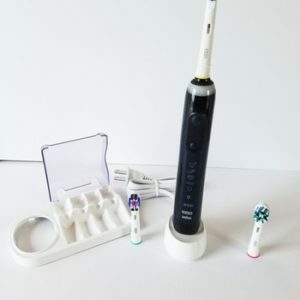 On the other hand, if your focus is on everything to maximize dental hygiene and oral health, and you intend using the several features included in the Oral-B Genius Pro 8000 , then it could be a great investment. With a selection of cleaning modes, great design and a good battery life, the Oral-B Genius Pro 8000 is a wise choice for most users. And for this value, the price is reasonable. When you begin using this toothbrush, you’ll begin to appreciate the nuances of design and ease of use such as how easily the compact brush head lets you access areas behind the last molar teeth, or how different modes let you effectively remove plaque and avoid gum injury. And the app’s functionality will thrill you as you continue using it and see the progress being made in a clear visual display. Q: Is the Oral-B Genius Pro 8000 an oscillating brush? A: Yes. The patented 3D motion combines rotation, pulsation and oscillation to deliver an excellent cleaning experience. Q: What is Gum Care mode? A: It is a lower speed setting that is gentler on sensitive teeth and gums, stimulating blood flow and improving gum health through a massaging action. Q: What is Daily Clean mode? A: This is the most commonly used regular brushing mode where the combined oscillating and rotating action of the brush head cleans teeth and removes food debris impacted between teeth and gums. It removes dental plaque upto 300% more effectively than a manual toothbrush. Q: What is ProClean mode? A: This is a newer mode offered in the Oral-B Genius Pro 8000 electric toothbrush . It delivers extra force through an added 3000 movements per minute over and above the regular Daily Clean mode. It can be intense and uncomfortable for some users, but delivers superior cleaning effect. Q: What brush heads are included? Is it compatible with other heads? A: The Oral-B Genius Pro 8000 comes with 3 brush heads – Cross Action, Sensitive and 3D White. They are all interchangeable. The same brush handle can also be used with other kinds of brush heads like Floss Action, Precision Clean, TriZone and Pro Results heads. Q: Is a pressure sensor included? A: Yes, the Oral-B 8000 has a pressure sensor that indicates too much force with a glowing red LED display. This helps prevent injury to teeth and gums from pressing too hard. Q: Does the 8000 have bluetooth? 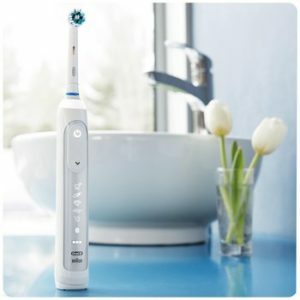 A: Yes, the Oral-B Genius Pro 8000 uses bluetooth to connect with a smartphone app that delivers several additional features for tracking and monitoring use and progress. Q: What is Position Detection? A: In the Oral-B Genius Pro 8000 , a new technology called Position Detection helps with self-tracking to ensure thorough and complete cleaning. It also records personal statistics, encourages better brushing technique and engages users through games and challenges to develop a healthy cleaning habit. A: Yes, the Oral-B Genius Pro 8000 electric toothbrush comes with a 2 year warranty. You can extend it further by an extra year just by registering online on Oral-B website for free. A: The battery lasts for 48 minutes of use following a full recharge. This means with typical use, you’ll have to recharge your toothbrush once in every 12 to 14 days. A: A full recharge can take 12 to 20 hours. When completely discharged, a 30 minute recharge will allow enough power for a single cleaning session of 2 minutes. A: Yes, the Genius Pro 8000 comes with a charging station that can connect to any bathroom socket. It is not wall mounted, but has to be placed flat on a countertop. A: Yes, a travel case is included in the package. Hopefully this Oral-B Genius Pro 8000 electric toothbrush review has addressed your major questions about the device. If you have any further questions or comments, feel free to leave a comment.